On the left is Peter Tierney owner of Quiggins Attique, He’s an NF candidate supposed to be standing for Mayor of Liverpool. He got arrested yesterday for getting hot under the collar outside a court case involving a muslim peodophile gang, obviously his issue is that the gang is muslim, not peadophiles, as we’ve never seen him outside a case involving white peado’s! On the right is Mike Whitby, he’s a BNP candidate also standing for Mayor of Liverpool. He got his door busted down by cops after refusing to come out for 6 hours and was then arrested. He faked a bunch of legal papers, “Under electoral law, a candidate must gather a proposer, seconder and 28 other signatures from electors in order to be eligible to stand as mayor.” – it seems he couldn’t get 28 people to support him so he did the next best thing, and made it up! 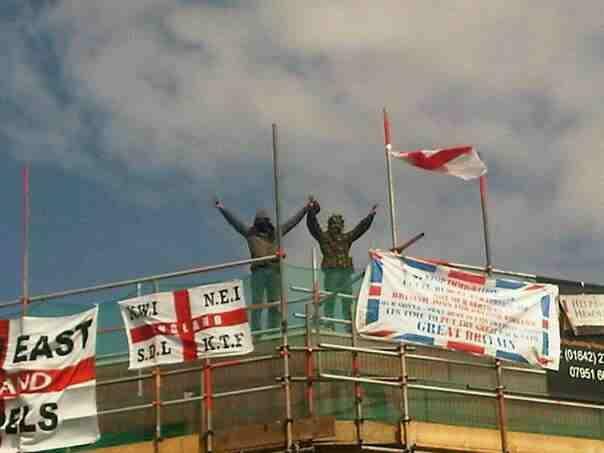 Today was the Infidels of Britain’s nationwide day of “direct action.” In Liverpool, we were promised that the Scouse Infidels would be “busy bodies,” and they even had a special National Front “Vote Quiggins” banner for the occasion. In reality, Liverpool Antifascists got the drop on the far-right, who were nowhere to be seen in the city when it came to it. In the morning, around 20 anti-fascists headed to Quiggins Attique on Aigburth Road. This is of course the shop owned by NF mayoral candidate Peter Tierney. We arrived at about 10am, with the shop due to open at 10.30, to unfurl our banner in front of the shop and begin handing out leaflets. The leaflets were about the mayoral elections generally and all three fascist candidates, but we did have posters (PDF) which underlined Tierney’s standing as a convicted, violent thug, and pointed out to those who took our leaflets exactly what the man was capable of. Whilst we were there, the response we received from the public was almost universally positive. People took our leaflets, stopped to talk to us about fascism and offer us their thanks and support. The only exceptions were one racist old man who said he would vote for Tierney “if he’ll send the coloureds back,” and the man who lived above the shop. He came out with a big dog on a leash and whirling a chain. He was clearly in the mood for a confrontation, though wide-eyed and clearly put out when nobody backed away from him. He accused us of kicking a door in, which was self-evidently false as no doors in the area had been kicked in, before declaring that he wasn’t part of anything. He quickly belied that, however, when he tried to threaten a female anti-fascist who gave him short shrift before he disappeared. Throughout all this, Tierney remained inside the shop. He had been seen entering by the first comrades on the scene, and it was noted that he appeared to recognise at least one of them. After that, we heard nothing from him and the shutters remained down long after the scheduled opening time. Our picket continued until midday, with leaflets dropped through letterboxes on the neighbouring streets as well as distributed to largely receptive passers-by. We then called it a day and packed up, to head into town with the expectation that the Infidels – who had failed to show in support of the man they’d had a banner made for – would be turning up at some point for their big day out. Our scouts report that Tierney’s shop remained closed for well over an hour after the picket ended, only finally being seen open at 2pm. The wild-eyed upstairs neighbour, “nothing to do with all that,” was stood outside with his dog and his chain. In the City Centre, we met up with anti-fascists who had been taking part in action under another banner. In Childwall, a fifty-strong counter demonstration against anti-abortion zealots was running concurrently with the picket. This, too, was highly successful and everyone was on a high when we reached town. However, the afternoon would be a chilled out one since it emerged that the Infidels had been bussed out to support a demo elsewhere in the North West. Today underlines, yet again, that there is a world of difference between where the fascists are and where they think they are. The Infidels are the most radical of the active nationalist groups right now, having adopted anarchist tactics such as occupations and banner drops. They have also given a new lease of life to the National Front, formerly dead on its feet and not worth mentioning. But their “big” turnouts still require bussing loads of people in from across the country and – without a populist cause to exploit like paedophiles or “the IRA” – even that is often inadequate. Not that anti-fascists should be complacent. February 18 happened because we dropped the ball, and subsequent victories were down to actively mobilising people and raising awareness of the physical threat the far-right potentially pose. As the struggle against fascism goes on, we need to keep mobilising people and getting feet on the street otherwise this trend will not continue.